All merit badge and Webelos pin programs have a 6 scout minimum; so, classes will not be set up until 6 paid reservations are received. Any Boy Scout badge or Webelos pin program outlined below is available on any day Laurel Caverns is open. Please send your prepayment, along with the reservation form at the link below to: Reservations – Laurel Caverns – Post Office Box 62 – Hopwood, PA 15445. Plan well ahead. You do not have a reservation until we have full payment in advance and you have a written confirmation. Phone: 724-438-3003 if you have any questions concerning the reservation form. Also, please note that the release forms for Rappelling, Lower Caving, and Upper Caving must be signed by all participants; and for anyone under the age of 18 to participate in the activity, it must be signed by a parent or legal guardian as well. These three-hour programs are offered at either 10:00 AM or 2:00 PM and include a 20-30 minute orientation on cave safety. The appropriate release form, which explains the spelunking activity, must be signed by a parent for each participant under 18 years of age. There is now a Boy Scout patch for cave exploring. This highly educational program is done in the upper cave (Lighted area + Cale’s Canyon, Ballroom and Bat Room. The program begins at 10:00 am or 2:00 pm and concludes at 1:30 pm/5:30 pm. Please go to Spelunking – Caving for more information and for the links to their respective release forms. The above rates are subject to troop minimums. Proper caving shoes are not reusable to an outfitter. Coveralls would have to be laundered after each use and the sand in them makes that very expensive. Lights could be rented but when that was tried they usually disappeared, so now they can only be sold. Thus, if Laurel Caverns outfits you for lower caving, the cost is $85 per person. If you outfit yourself, the cost is as above. Remember that two sources of light are required. A headlamp and a handheld light are best. Cellphone light, keychain lights, and other such dim sources are not acceptable. Please forgive us for the strict enforcement of these policies. We are regulated by the Bureau of Deep Mine Safety even though we are a natural cave. We are, by law, required to follow their protocols, especially with respect to rescues. Twisted ankles have to be treated as broken until X-rayed. Caving is a high adventure activity and can be dangerous. The terrain is rough and uneven. It is not a stroll through a shopping mall. Please don’t prepare for our lower caving trip as if it is. Upper Caving is safer in that it does not have the cliff structures found deeper down inside the mountain. Please see above for the Upper Caving Release Form. Class times are 10:00 am and 2:00 pm every Saturday and Sunday and at other times by appointment for groups of six or more. See Cave Rappelling for more information. This activity is designed for beginners. The activity begins with an instruction session. A double belay (two-ropes – two staffers) is used. All equipment is provided by Laurel Caverns. Every participant is guaranteed at least two drops. Since our rappelling cliffs are in the cave, rain is never a problem. Participants must be at least twelve years of age. The cave rappelling activity requires our signed release form which, for anyone under 18 years of age, must also be signed by a parent or legal guardian. This form must be read carefully for it will convey a sense of the risks associated with high adventure cave rappelling. Any individual under the age of 18 arriving without a parentally signed release form will not be admitted to a rappelling activity. Trip sponsors and leaders may not sign for anyone as a proxy for the parent. PLEASE NOTE: No individual(s) under the age of 18 may participate in Cave Rappelling unless an adult having supervisory authority for the individual(s) is present during the program in the cave with them – Visit the Cave Rappelling tab for more information. This three hour program is offered at 10:00 AM and includes a one hour class, a one hour field walk and a one hour geology oriented cave tour. The morning program allows for a 30 minute lunch break, though lunch is not included in the program. Participants should dress for the weather and wear suitable shoes. Participating siblings will be charged the same as the scouts, except for preschoolers. There is no charge for preschoolers, but it is asked they be excluded from the classroom part of the program. Cost: $14.00 per scout or sibling and $12.00 per adult observer. This programs is designed to permit the scout to meet all the requirements of the pin program. It requires at least two to three hours and is offered only at 2:00 PM. Thus, both Geologist and Forester pins can be acquired in a single day. The first hour is done indoors as a classroom and the second as a field walk. There is no cave tour in this program and thus, no charge for adult observers. Participants and siblings will be charged the same as the scouts, except for preschoolers. There is no charge for preschoolers, but it is asked they be excluded from the classroom part of the program. This pin is offered May through October. Appropriate dress for the day and season is suggested. Cost: $8.00 per scout or sibling per program. Adult observers are not charged. 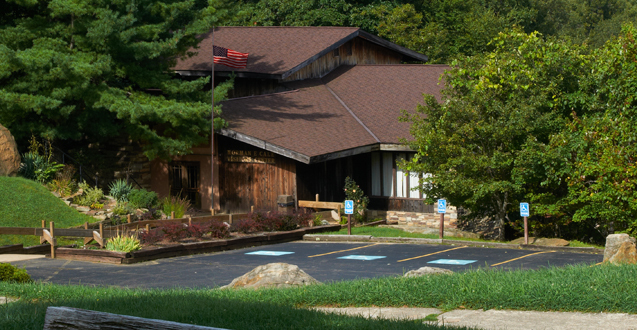 The Laurel Caverns Reservation Office is available 12 months a year. This family oriented program combines our one hour family tour of Laurel Caverns with Kavernputt, a miniature golf game through the largest simulated cave in the world. Siblings are invited as participants. At the conclusion of activities, child participants (only) receive a bat patch as a memento of their adventure. (Many groups add panning for gemstones or panning for fossils to this activity for an additional $6.00 per child.) Cost: child participants: $14.00 each, parents and siblings are charged the same as scouts. Pre-kindergarten siblings are not charged. Note: Prepayment is not required for any program involving Tigers, Bears or Wolves but we do need notice of your plans so that we may be properly staffed.